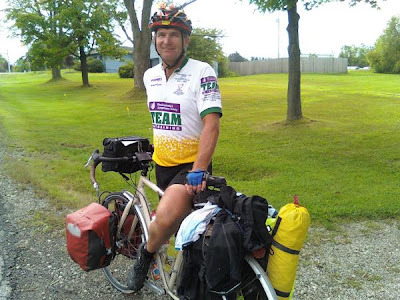 I was riding around the Richfield area with some friends yesterday morning, and came across this guy, who was taking a break on his way from Medina to Ashtabula, getting closer to the end of a bike trip from Sacramento, California to Boston, Massachusetts. His name is Steve, and you can follow his progress on his blog at www.greatisland.net/blog/. He was riding a Raleigh Sojourn touring bike, which he said he's been loving. The only issue he had was having to have the bottom bracket replaced in Colorado; not a bad record for that many miles! The bar-end shifters are popular with touring bicyclists for two reasons: 1) They are much less expensive than integrated brake/shift levers, and 2) They are much simpler mechanically, and easier to adjust and repair in the middle of nowhere. The left-hand shifter is always in "friction" mode, meaning it does not have click stops, it just has a continuous range of motion. This is a little less convenient than having click stops, but it gives you the ability to infinitely fine-tune to position of your front derailleur to eliminate the chain rubbing no matter what gear you're in. The right-hand shifter is switchable between indexed and friction modes. Suppose you're in the middle of nowhere, and your rear derailleur gets bumped and knocked out of whack, and no matter which way you click your shifter, it just keeps going crazy and won't shift or stay in the gear you want consistently. Just flip it to friction mode, and you get the same infinite adjustibility as on the front derailleur. Just move the lever until it shifts into the gear you want. Hearing a little clicking noise in the rear? Just nudge the lever up or down a hair, and voila, the noise is gone! Try it; you'll like it--on a stock Surly Cross-Check, stock Surly Long Haul Trucker, Raleigh Sojourn, or Masi Randonneur! Well, yes, the bar-end shifters are not going to be as quick and responsive as your integrated shifters. I would not want to be using them in a race situation. But, when you're in a touring situation, typically loaded up with 40-50lbs of gear, you're not going to get as much of a boost on the uphill from the downhill you are just coming off of, like you are used to on a regular road bike. Trust me, you will have PLENTY of time to down-shift. I had the same attitude as Mars Girl when I started looking for a touring bike. But I can tell you after two months of riding everyday across the country you get very used to it. when I got back I "went for the bar ends" repeatedly. So it comes down to what you're used to at any given time. We all adapt. What sort of bottom bracket comes stock on the Sojourn? Standard sealed Shimano or a less reliable unit? The Raleigh Sojourn comes with a Shimano Octalink splined bottom bracket.